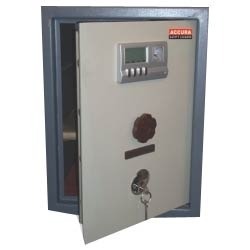 We are renowned enterprise involved in supplying and trading high-quality Biometric Safety Lockers. These lockers opens and closes after recognizing the correct thumb impressions. If it identifies a wrong thumb impression for more than 3 times then the alarm glows. With the procurement being done from well-known vendors, we have with us wide specifications of these lockers for supply to customers as per their precise requirements. Accura Network Marketing (P) Ltd., established in 2001, is a private limited Company known for providing good quality products to clients for the last many years. An array of Currency Counters, Safety Lockers, Fake Note Detectors, Paper Shredders, and Surveillance Cameras are manufactured and marketed by us. Our products are available in the market in various sizes, specifications and designs. Our products are highly in demand amongst the customers due to their long life and reasonable prices. We also have different show rooms all across the city for selling our products. Our dedicated team of 120 employees ensures customer satisfaction and does an annual turnover of over 5 crore per annum. Customers can purchase products from us in bulk as per their requirements and needs.